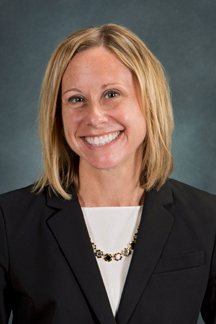 ROCHESTER, N.Y. -- Carrie Fuller Spencer has been named chief financial officer (CFO) of Strong Memorial (SMH) and Highland hospitals effective immediately. She has held the position of interim CFO at Strong since last October. As part of this role, she also will provide financial oversight for UR Medicine Home Care and Highland Long Term Care facilities. Adam Anolik, selected as URMC’s CFO in October, said Fuller Spencer brings a powerful combination of financial savvy, an in-depth knowledge of healthcare finances and a keen understanding of industry trends that will serve her well in the position. Anolik said that Fuller Spencer will continue to work alongside several other key financial leaders at URMC – School of Medicine’s William Passalacqua, URMFG’s Marc Cohen and URMC’s Kathleen Strojny– to build an integrated financial foundation for all URMC entities. Witt/Kieffer, the executive healthcare recruiting firm retained to conduct the CFO search, endorsed the selection of Fuller Spencer, highlighting her strong understanding of Strong Memorial and Highland hospitals’ financial and business operations and the vital role they play in helping URMC and the entire University meet the rapidly changing needs of an academic medical center. Her accomplishments include helping to ensure the successful launch of the ePARC project, which introduced a new technology system to manage UR Medicine’s $3 billion revenue cycle. She also has developed and managed annual capital and operating budgets for both Strong and Highland hospitals, as well as contributed to the successful recruitment of several important financial positions. She currently is a key member of the leadership team implementing a new funds flow model across the Medical Center to optimize alignment of funding support across our three mission areas. Fuller Spencer joined URMC in 2014 as director of Strong Memorial Financial Services, where she was responsible for the overall management and supervision of financial operations at the hospital. During the previous four years she has also provided financial leadership for Highland Hospital, the Highland long-term care affiliates as well as Strong Home Care. In addition, she has served as a policy adviser on matters related to the financial management of Strong, Highland and related affiliates, including financial reporting and analysis, budgeting, capital financing, internal controls, audit oversight and patient accounting. “Carrie has the financial acumen, institutional knowledge and sound grasp of the complex reimbursement challenges that all hospitals face today. I look forward to working with her to ensure we maintain a firm financial footing for our hospitals in the years to come,” said Steven I. Goldstein, president and CEO of Strong Memorial and Highland hospitals. Before joining URMC in 2014, Fuller Spencer served as the CFO of Arc of Onondaga and was a manager in the accounting firm PricewaterhouseCoopers (PwC), specializing in higher education, healthcare and not for profit organizations. She holds a B.S. in Accounting from the State University of New York at Oswego. Fuller Spencer currently serves on the Board of Directors and Finance and Audit Committees at Villa of Hope, is a member of the Finance and Audit Committees of the Medical Center Insurance Company, and also is a member of the Finance Committee of the Rochester Regional Health Information Organization. She is also a Board member of the local chapter of the Healthcare Financial Management Association. In 2016, she was a recipient of Rochester Business Journal’s Forty Under 40 award, which honors area professionals younger than 40 who demonstrate leadership in the workplace and in the community. An avid runner who logs about 45 miles each week, she lives in Webster with her husband Michael and their daughters, Isabella and Alexandra.